Have you ever seen a parking lot spray painted with various colors on the surface? Have you noticed a field or a school campus with small, colored flags in the ground? These are called public and private underground utility markings for work about to be performed or for planning purposes. So What Do They Mean? What Are They? They are called Utility Markouts. Underground utility designating is the process of identifying and marking underground utilities. 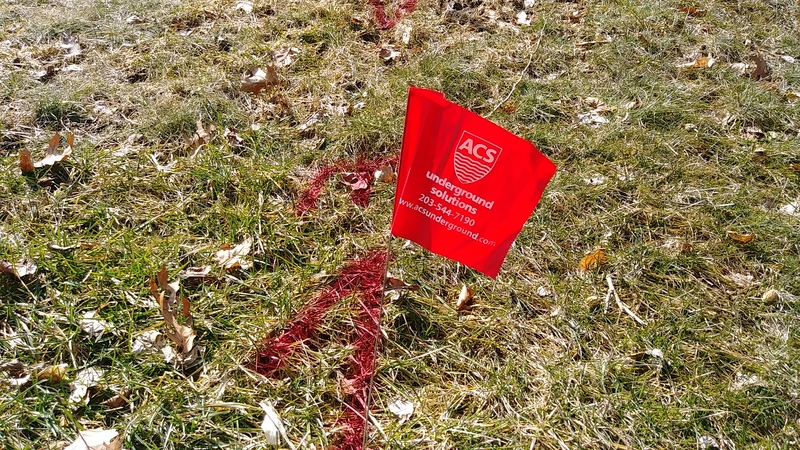 The way they are marked is always on the surface of the ground with spray paint and pin flags using their corresponding colors recommended by American Public Works Association (APWA). Below is a chart that is found on our website under our services for Underground Utility Locating showing the uniform color code guide. Red or yellow are most dangerous if the situation is not taken seriously, you really want to keep as far away from high voltage electrical cables or natural gas pipes as possible when conducting drilling, digging, excavation or other ground-intrusive work. Green marks are for sewer and drain pipes. Sewer and storm drain mains usually have manholes for access with certain spacings along their routes. Orange marks are usually for telephone, TV and other communication lines. Although in general the damage to these lines doesn’t cause immediate life-threating events, the repair cost could be really high. The yearly repair costs for telecommunication cables due to ground-intrusive work have been estimated as hundreds of millions of dollars in the U.S. alone. In addition, the revenue lost for the users due to the downtime could be much higher than the repair cost itself, especially for those high capacity fiber optic cables. Blue marks are for potable/drinking water and fire lines. Water pipes usually have valves accessible on the ground surface along their main routes and service lines including hydrants. Other colors such as purple and pink and white are sometimes used for unknown/unidentified underground utilities or proposed areas for excavation or other ground-intrusive work. WHENEVER YOU SEE THESE MARKOUTS IT IS ALWAYS SMART TO PROCEED WITH CAUTION, IF YOUR NOT FAMILIAR WITH THEM. These utility markouts are very useful in telling you what is located below the ground they help architects, engineers, and excavators, or any kind of construction that is needed to be done.